If you were a kid in the early 90s, a few fashion trends probably still make you nostalgic and sentimental: flannel shirts, mood rings, scrunchies, and light up shoes. Footwear that went beyond simple function and made a bold fashion statement was a new thing in the 90s, but this fashion trend is now back and better than ever. Parents who grew up in LA Gear now have kids that love HoverKicks. Not only has the trend of light up shoes come full-circle, but modern brands have made impressive improvements upon the epic original. Let’s learn a bit more about the evolution of light up sneakers over the past 25 years! came in bright colors and had revolutionary soles that lit up at the heels. As with all fashion trends, light up shoes have risen and fallen in popularity over the years, and other light up shoe brands emerged and found a niche following as well. When Did the First Light Up Shoes Come Out? 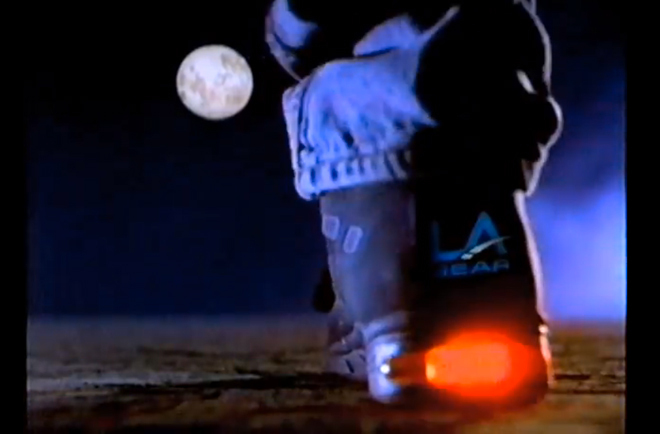 LA Lights hit the footwear scene in 1992 and were most commonly found at Foot Locker stores. In no time at all, they became the coolest thing in kids’ fashion, and the company sold over five million pairs over a 12-month period soon after they appeared in stores. Nothing like this had ever been seen before, and kids in particular were mesmerized by the glowing lights that flashed when they walked or ran. What Happened to LA Gear? While glitz and glamour characterized the 80s, 90s fashion began to follow grunge culture. Adults started to gravitate towards black clothing instead of bright colors; however, 90s kids still remained in love with their light up shoes. But then problems came for the company when mercury was discovered in LA Lights shoes. This metal was used in the switches that powered up the LED lights and can be toxic to humans. Parents became concerned about their children’s health and slowly stopped buying the shoes. Some states, like Minnesota, even banned the shoes from stores. Ultimately, this chain of events caused bad press and LA Gear’s stock to drop. The company essentially collapsed in 1998 but has more recently begun to revive itself with new shoe designs. Without a doubt, there are many similarities and differences between the first light up shoes from LA Gear and today’s light up shoes from HoverKicks. LA Gear’s light up shoes were eye-catching and a status symbol among kids on the playground. But while this type of footwear was mostly marketed at kids, today’s light up shoes are for all ages. With fashionable designs to suit every style, HoverKicks have been tremendously popular among young kids, teenagers, adults, and even seniors. While LA Lights only had small LEDs in the soles of each shoe, HoverKicks light up all around each shoe for even more illumination. More lights in all directions means more eye-catching potential with each step. And fortunately, even with inflation over time, the price of light up shoes today is still nearly the same as what it was in the early 1990s! But one big difference between light up shoes of the 90s and those of today is safety. HoverKicks are LED sneakers that come with safe, USB-rechargeable batteries that contain no mercury. This means you won’t have to worry about exposure to any toxins or metals while wearing them, which is important for kids and adults alike. Simply charge them once and they’ll stay lit for over six hours. From smartphones to tablets and fitness trackers, everything is charged via USB today, so now you can charge your sneakers too! Across all brands, light up shoes bring fun to your days and a little magic to every step you take. Whether you’re five, 15, 35, or even 85, light up shoes have finally broken the age barrier and are a fun way to show off your personality to the world. So check out our latest collections to embrace the reemergence of this fashion trend, have a little more fun, and brighten up your days! I don’t remember these but my kids want them so I had to have them at 40 years old and male too. L.E.D shoes are good for night time’s or special events I like these shoes cuz they’re helpful and if you want to stand out of the crown you should get a pair of LED shoes.